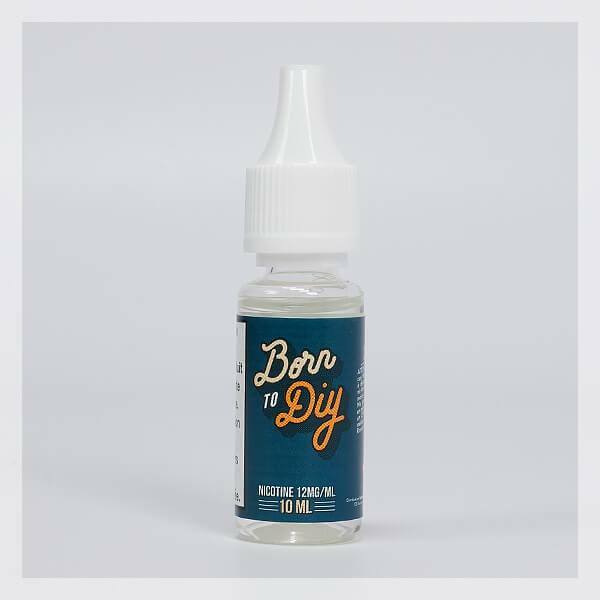 With the Born To DIY 10ml base - Le Petit Vapoteur, maker of e-liquids, is within reach for all. The base Born To DIY 10ml have different rates of nicotine to choose from, ready to use. It is simple enough to add the aroma of your choice. A base which meets pharmaceutical quality standards, with a composition of 70% Propylene Glycol (PG) and 30% Vegetable Glycol (VG) for a good balance between vape and flavour. 5 Rates of Nicotine to choose from: 3mg, 6mg, 9mg, 12mg, 16mg/ml. Prepare Rapidly and Simply your e-liquids with the base Born To DIY Le Petit Vapoteur. The base Born To DIY is ready to use, simple enough to add the aroma of your choice, eventually with additives if needed. To prepare the liquid in 70/30 - PG/VG, it is generally advised to add 10% to 15% of aroma. The base Born To DIY meets pharmaceutical quality standards. With the composition 70% in Propylene Glycol (PG) and 30% Vegetable Glycerine (VG) for a good balance between flavours and vape. The Propylene Glycol promotes the fluidification and expression of the aroma aswell as the hit. The Vegetable Glycerine allows the production of the vape. There is a choice of Nicotine levels:3mg, 6mg, 9mg, 12mg, 16mg. Conditioned in a 10ml PET vial with a Spout. If you are strongly dependent on nicotine, we advise you to choose a 500ml liquid base with a nicotine level of 16mg/ml to begin with associated with powerful, variable voltage electronic cigarette which will allow you to increase the amount of vapor and hit in the throat. If you are moderately dependent on nicotine, we advise you to choose a 10ml liquid base with a Nicotine level of 9mg to 12mg/ml. If you are weakly dependent on nicotine, we advise you to choose a 10ml liquid base with a Nicotine level of 3mg to 6mg/ml. If you are a non-smoker, avoid absolutely e-liquids containing nicotine. In regular smokers, the number of nicotinic receptors are highly increased limiting the effects of nicotine, however for a non-smoker the risk is highly dependent and overdosing is real. To give you an idea, Take the test. Warning : Nicotine is a product highly dangerous, even when diluted, so please handle with precaution. Always wear protection gloves and protection glasses when handling the 10ml Nicotine Base - 70/30 of Born To DIY. Store your Vials in a well-protected place only accessible for yourself (Secured Lock), and away from light. Never skip the maturation stage. To shorten the waiting period, you can stir the product from time to time to encourage the maturation.